The Solomon Islands Football Federation (SIFF) and the general football fraternity have paid tributes to outgoing Technical Director Felipe Vega-Arango after two years working in the country. Felipe as he is known in the Islands arrived two years ago under a partnership between SIFF and LaLiga. The Spaniard took charge of the technical director’s role, sent by the Department of Sports Projects of LaLiga, which performs similar training and advisory work in 32 countries around the world. A short time later he was named as coach of the national team ahead of the FIFA World Cup qualifiers with Papua New Guinea. 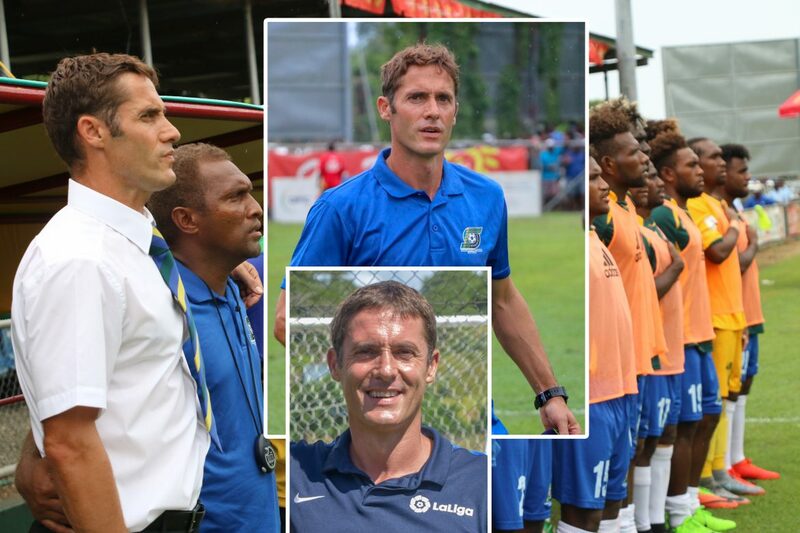 The Spanish coach led the Solomon Islands to the final play-off stage of the Oceania confederation FIFA World Cup qualifier after two wins over Papua New Guinea both home and away, in one of the few countries in Oceania where football is (by far) the national sport, that his national team reaches results without precedents. An away defeat to New Zealand and another defeat at the hands of Vanuatu at the 2017 Pacific Mini Games were the only two competitive matches Solomon Islands lost under the guidance of the Spaniard. Felipe architect a 2-2 draw against New Zealand in the home game of the final stage of Oceania World Cup qualifiers. “We played that game in Honiara, the capital of the country. There were some 20,000 people cheering the team up in a stadium [the Lawson Tama] that does not even have steps: the public sees it from a hillside “, recalls the Asturian coach. “We lost, but that match was tied and the people were happy. It was a party”. Felipe who has a UEFA Pro License was handful in educating local coaches in the Solomon Islands. He trained 190 coaches in 2017 and the number increased to 250 in 2018 with OFC Senior C License and OFC B License coaches offered in Honiara. Most evident was his role behind the success of the country in the OFC U-16 Championship hosted on home soil last year which saw the national youth side earned a historic qualification to the 2019 FIFA U-17 World Cup that later ruled out by OFC Decislipenary Committee for fielding an ineligible player. As his contract runs out, Felipe was offered another job by LaLiga under the department of sports project and SIFF woud like to wish him all the best. The Spaniard officially leaves the country this week and left a simple message behind to invest in youth football to see Solomon football flourish. “In Solomon they have to invest in the children, that is the only way,” he said. “I am so sad, words don’t describe my sadness, and it is a sad day. Solomon Islands stole my heart. Felipe would like to thank SIFF staff, coaches, players who have worked with him and the Solomon football community for a wonderful two years together. Meanwhile, national players and football officials alike pay tributes to Felipe’s contributions to Solomon Islands football during his two years stint.